There seem to be two Roger Erickson's on his 1983 Topps Card. 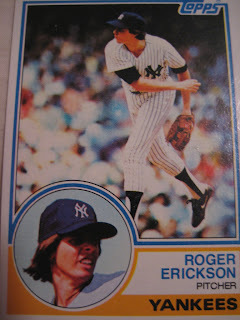 The top Erickson is a normal looking pitcher for the New York Yankees. But what is that bizarre picture on the bottom? It doesn't look like an airbrushed photo so much as an drawing by a comic book artist. His face and hair don't look any more realistic than that cap.